The rite of Pastoral Care of the Sick begins with a General Introduction. In this discussion, I’ll adopt the acronym PCS for easier reference. Not as commonly heard as “RCIA” but hopefully helpful. 1 Suffering and illness have always been among the greatest problems that trouble the human spirit. Christians feel and ex­perience pain as do all other people; yet their faith helps them to grasp more deeply the mystery of suffering and to bear their pain with greater courage. From Christ’s words they know that sickness has meaning and value for their own salvation and for the salvation of the world. They also know that Christ, who during his life often visited and healed the sick, loves them in their illness. Healing is not seen as a single goal, or even a main thrust of the Church’s rites. Suffering is a mystery. This does not mean a sleuth-like approach will always net a neat solution. The cause and purpose of suffering often lies beyond rational understanding. The believer searches for deeper meaning when encountering a mystery. We begin with what we know: first, the link between illness and salvation, and second, that Christ’s gospel witness is verified in his healings as well as his compassion. 2 Although closely linked with the human condition, sick­ness cannot as a general rule be regarded as a punishment in­flicted on each individual for personal sins (see John 9:3). Christ himself, who is without sin, in fulfilling the words of Isaiah took on all the wounds of his passion and shared in all human pain (see Isaiah 53:4-5). Christ is still pained and tor­mented in his members, made like him. Still, our afflictions seem but momentary and slight when compared to the great­ness of the eternal glory for which they prepare us (see 2 Corinthians 4:17). Not only is this sound Catholic theology, but the Jewish prophetic tradition also explored this line. While it was once thought that outward signs in one’s life point to misfortune, that is not always the case. Certainly, there are cause-and-effect connections: a lifelong chain smoker may suffer from lung cancer. And nicotine may well be the killing agent. But not all smokers develop cancer, and not all cancer sufferers are smokers. Why do some offenders suffer and others get off? It’s a mystery. 3 Part of the plan laid out by God’s providence is that we should fight strenuously against all sickness and carefully seek the blessings of good health, so that we may fulfill our role in human society and in the Church. Yet we should always be pre­pared to fill up what is lacking in Christ’s sufferings for the sal­vation of the world as we look forward to creation’s being set free in the glory of the children of God (see Colossians 1:24; Romans 8:19-21). Resistance is not futile. A believer need not passively accept illness as a punishment. Note the words used: “fight strenuously against all sickness.” It would seem that applies to caregivers and medical professionals as well as family members and the individual, and indeed, section 4 states that explicitly. Moreover, the role of the sick in the Church is to be a re­minder to others of the essential or higher things. By their wit­ness the sick show that our mortal life must be redeemed through the mystery of Christ’s death and resurrection. The corollary is that healthy believers will be open to the witness of those who are sick. That is why we have a presumption of public, not private rites, and that the parish is ideally involved in ministry to the sick: liturgically, charitably, and in all appropriate ways. 4 The sick person is not the only one who should fight against illness. Doctors and all who are devoted in any way to caring for the sick should consider it their duty to use all the means which in their judgment may help the sick, both physi­cally and spiritually. In so doing, they are fulfilling the command of Christ to visit the sick, for Christ implied that those who visit the sick should be concerned for the whole person and offer both physical relief and spiritual comfort. This introduction lays the groundwork for the theological and liturgical approach the Church takes in its rites of pastoral care (PCS). Because of this, we would assume a rejection of the older biblical passages that link suffering to personal sin. Moral blame is not the Christian understanding of suffering. 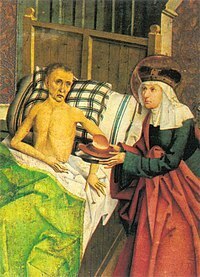 We will also see that to the extent the readings and prayers associated with PCS reflect these basic principles, the rites will support the Church’s theology, teach it by celebration, and reinforce it pastorally for those who are sick, those who minister to the sick, as well as the main body of the faith community. Any comments on today’s post? Remarks like this suggest a new way to think of the anointing of the sick: the one anointed becomes ‘alter Christus’, another Christ, as in Ordination. We look to them for the sufferings they offer to God, to learn about “the Great Mystery of suffering” as they experience it, and to know what kinds of priorities rule in the life of those who live out suffering with Christ. Others, who have worked with the sick, must know more about this than I do? Does this idea match people’s experience of the sick? Does it offer insights into the nature of priesthood? In my recent walk along the Camino of St James in northern Spain I saw many and various reminders – signs, hospital ruins etc- of how the church cared for sick (and poor) pilgrims along the medieval route to Santiago. Many did not make it, and there are remnants of many pilgrim cemeteries as well.